If you follow this blog, you know that we like to get things done….despite the usual consultant approach! We like to deliver results, not reports! Do not hesitate to show “work in progress” prototypes, mock-ups, sketches or ideas to your customers. Validate your assumptions early in the process and define product requirements based on their feedback…not your most experienced engineer’s evaluations! Product developers are too close to the product to see where it needs improvement, but customers who already use similar products are an excellent source of objective and useful feedback. Meetings should be used to make important decisions….not to get everyone up to speed. Regular communications should be fast and constant, using email or a product management software. Meetings can then be reserved for decision-making. 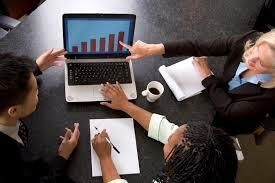 The most efficient meetings have strict agendas which are adhered to, without going off onto tangents. Only the people who really need to be invited to the meeting should attend, so that time is not wasted explaining things to those less involved, or allowing each person to have a say. Instead, after the meeting, send a summary email to all those peripherally involved. Schedule meetings for less time than you think you need. This will help you finish the meeting faster and waste less time. If you schedule a meeting for a full hour, you will end up stretching it out for the whole time. But if the meeting is scheduled for half an hour, you are more likely to finish in 45 minutes. Also, don’t wait for latecomers. Start the meeting on time and let latecomers catch up on their own. Product development is like juggling with fire torches. You have to keep moving! Unlike other types of projects, you don’t often know what the end result will be until you have it in your hands. Collaboration between all departments, even with employees who don’t see themselves as designers, helps develop creative and high quality innovation. Understanding the framework of what everyone is doing is key to success throughout the product development process. By asking a few questions to your team members, you will quickly get a sense of the potential roadblocks to your project. Ask yourself: What in your existing context will help you realize your ambition, and what is likely to get in the way? Approach the innovation process holistically and make the organizational changes necessary before you start the actual process. Following these four guidelines will help your project team become a lot more agile and improve your success rate.